A telephone rings in the dark�three times, pauses, then rings three times again. A fully-clothed figure lights a cigarette before rising from bed, dons a raincoat, then sets out into the night. Another figure emerges from the shadows, lights a cigarette, then discards a crumpled cigarette pack, which the first picks up and carries home. Back in his room, the first man places the refuse on his desk, paces apprehensively about his apartment before he finally removes the inner foil and examines it. 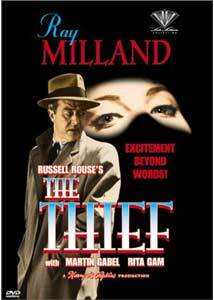 After letting what it reveals sink in, he sets it on fire, and a cold look comes over his face...Thus begins The Thief, a 1952 cold war, espionage thriller—unique in that it is completely without dialogue—directed by Russell Rouse, and produced by Clarence Greene, who co-wrote the screenplay. Allan Fields (Ray Milland) is an award-winning nuclear scientist working at the Atomic Energy Commission research laboratory. He is also a spy, photographing top secret documents, then relaying the miniature film canisters back through an elaborate network to enemy agents in Egypt. His signal is the telephone, and his liaison outlines his assignments through instructions on his cigarette refuse, with nary a word spoken. It is a dangerous business, and one that creates many close calls—too close for comfort. When one of his assignments goes awry, the FBI begins to close in, and the race is on to leave the country before he is caught.The Thief has all the trappings of classic noir. Produced at the height of the "Red Scare," the film manages to maintain a constant state of tension, relying heavily on reaction shots and Herschel Burke Gilbert's riveting musical score. The cinematography heightens the effect, utilizing lighting and camera angles to convey the unspoken. Milland, who won an Oscar� for his role in Billy Wilder's The Lost Weekend, carries the part off to perfection, letting the audience read his character's thoughts solely through facial expression and body language. The direction also fools the audience into anticipating dialogue, then cleverly avoiding it. Only the Oscar�-nominated score and sound effects break the silence. This is a fascinating use of visuals to tell a story, and a gripping suspense film, which held my interest throughout, and aside from one sequence where Fields' conscience begins to plague him, the narrative is fairly straight forward, without much in the way of gimmickry. Avoid the back cover text because it gives away the ending, which was the only part that didn't really work for this reviewer. For those interested in cold war-era film noir, this is certainly worth a look, if for no other reason than its uniqueness. Image Transfer Review: This black & white film is as noir as noir can be; the visual quality here is quite impressive, save for some minor specks and dust throughout. The image is finely detailed without enhancement, has natural-looking grain, and a good tonal range in the blacks. Much of the picture is shot in dark situations, and shadow detail is quite reasonable. Audio Transfer Review: Mono audio is represented well, with a fuller spectrum than I would have expected for a piece this age. There is a bit of crackling and other minor anomalies here and there, some hiss, and a bit of source distortion when the horns really kick in, but nothing unusual. Extras Review: Like other films in the Wade Williams Collection, The Thief hides five trailers behind the atomic energy symbol. I'm sure everyone will be rushing out to see Bella Lugosi Meets a Brooklyn Gorilla, She Demons, Monster from Green Hell, The Flying Saucer and The Crawling Eye. I don't know what's scarier, that they actually made all these or that we have reviews of them all!